Newly created recipes and traditional favorites featuring wild Alaska salmon, seafood, venison. moose and waterfowl. Every recipe is kitchen-tested with one or more photographs. Preheat oven to 400F. Place an ovenproof medium-size stainless steel skillet, with lid, aside. Add all the spice blend ingredients onto a paper plate, then whisk to combine; set aside. Place the skillet (see photo) over high heat on stovetop with 2 tablespoons of Mazola oil. Meanwhile, pat chicken thighs dry with paper towel, including using kitchen shears to cut any excess fat without disturbing skin on under-side. Place prepared thighs in a medium bowl. Add half the spice mixture and drizzle with 1 teaspoon Mazola oil, then gently rub spices into both sides to coat evenly. Place chicken skin-side down using tongs into hot skillet, while sliding back and forth initially when doing so to prevent sticking. Sear for 4 minutes on skin-side down, turn over then do the same on the under-side for 4 more minutes. Remove seared chicken thighs to a paper plate and set aside; drain grease from pan while reserving drippings. Reduce heat under pan to medium-high and add the raw rice and sauté for 2 minutes. Add the other 1/2 of the reserved spice mixture, ketchup, Worcestershire, and lemon juice; sauté for 30 seconds. Deglaze pan with chicken stock while scraping bottom with a wooden spoon. 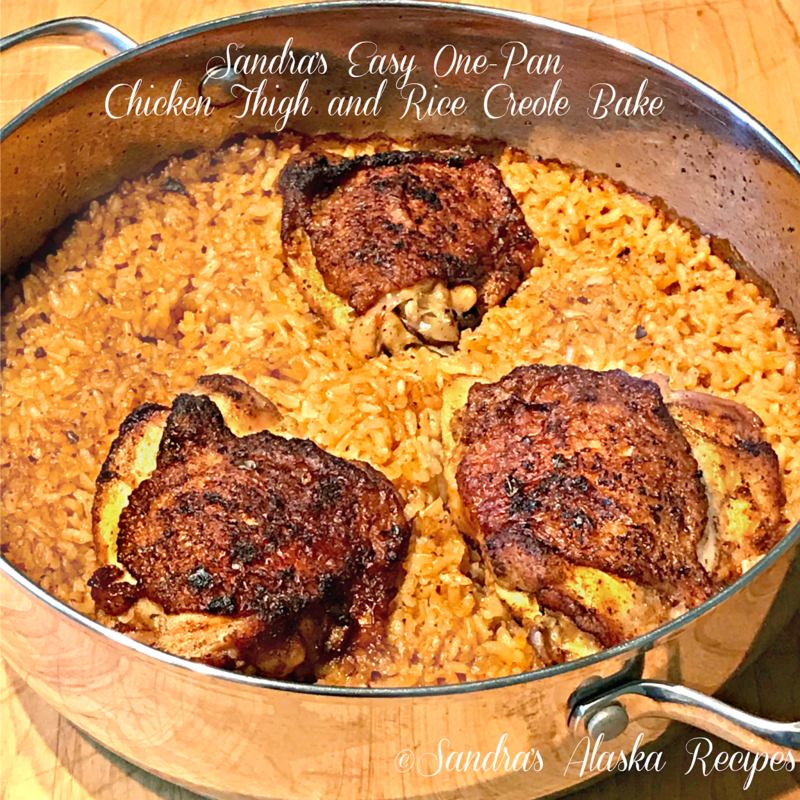 Using tongs, place the seared chicken thighs back into pan atop the rice, skin-side up. Cover, then bake, undisturbed, for 50 minutes. Remove pan from oven, leaving covered, and let rest for 10 minutes for chicken juices to redistribute. ~ Enjoy! "To eat is a necessity, but to eat intelligently is an art"
2010 Copyright Sandra's Alaska Recipes: Do not copy photographs or recipes without permission. Simple theme. Theme images by gaffera. Powered by Blogger.